New Eagles defensive end Michael Bennett. 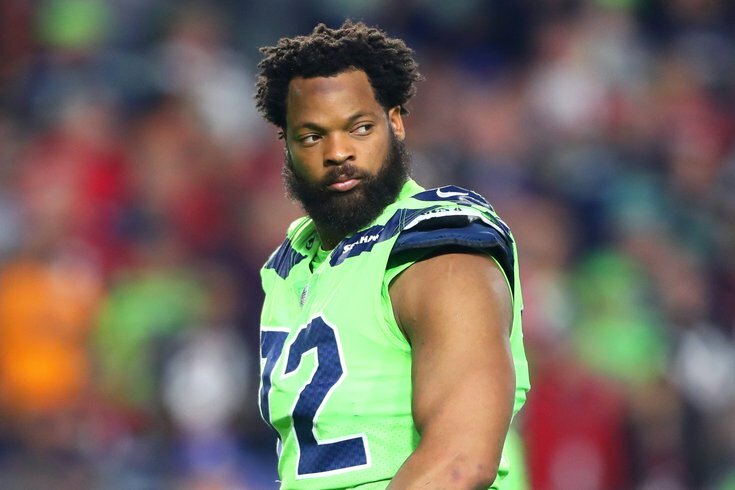 Philadelphia Eagles defensive end Michael Bennett turned himself into authorities on Monday following last week's felony indictment alleging he injured a disabled elderly woman after Super Bowl LI in Houston. Bennett, 32, appeared in a Houston courtroom for a hearing on the case was released on $10,000 bond. He was given a judge's permission to travel to and from his home in Hawaii. The three-time Pro Bowler, acquired earlier this month in a trade with the Seahawks, was charged more than a year after prosecutors said he shoved a 66-year-old paraplegic security guard at NRG Stadium in the moments after the New England Patriots defeated the Atlanta Falcons. Bennett was allegedly trying to get on the field to celebrate with his brother, Martellus, who was a member of the Patriots at the time. Bennett, who played high school and college football in Texas, allegedly defied the orders of multiple security guards as he shoved his way past them and onto the field. If convicted, Bennett's charge of "injury to the elderly" carries a sentence of up to 10 years in prison and a $10,000 fine. During a press conference detailing his department's investigation, Houston police chief Art Acevedo last week called Bennett "morally corrupt" and "pathetic." The incident was not captured on camera, but was witnessed by a police officer who, according to Acevedo, then allowed Bennett to remain on the field despite his alleged assault and lack of proper credential. The delayed charge against Bennett, an outspoken figure in the NFL, was the result of more pressing criminal matters, Acevedo said. Questioned Monday about developments in the Bennett case, Eagles executive VP of football operations Howie Roseman said he was unaware of the looming indictment prior to the trade with Seattle. Re: Michael Bennett - Roseman said Eagles were surprised about the indictment. Said they did a lot of research on Bennett, didn't know about this. Still gathering more information, have spoken to Bennett. Will let justice system play out. Roseman said he's not putting the Seahawks at fault, said Eagles trust John Schneider. "It's a unique circumstance. We'll deal with it as we go forward." NFL Commissioner Roger Goodell has not yet publicly commented on the allegations against Bennett or any potential disciplinary action that could arise as the case progresses.